London has so much to see and do. To hear anyone say I’m bored in London would have to mean they have no self motivation as there are endless things to involve yourself in from Buckingham Palace, Piccadilly Square, Hyde Park, Leicester Square…….. Theatres, museums, markets, parks, live concerts, Wimbledon, O2 stadium and numerous others. The list goes on. 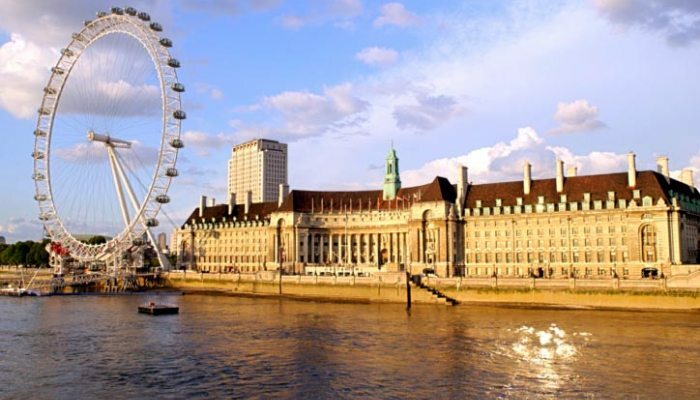 Double Decker red buses, the underground, hop-on-hop-off city tours, walking tours, Tower Bridge, Westminster…….there simply is too much to put down and spending 2 weeks here won’t be enough time to see them all. The 1012 Olympic Games are to be held in London. I can see this being chaos but I’m sure they will handle it. London to me though looks dreary and the weather is nothing fantastic. Everyone in London wears black and trying to find bright cheerful clothing in the shops is near impossible. The Camden Markets are your best bet for fun, funky and coloured clothing. You can get nearly anything you want here, I love this place. It’s also the place to see the wackiest hair do’s. Kensington is nice and different as it has a graceful feel about it. London has to be one of the easiest cities to get around and for moving onto other cities and counties the amount of trains leaving for all destinations is fantastic. From Plymouth to Scotland, there are trains from Waterloo, Paddington Liverpool, London Bridge, and Clapham Junction, Victoria,……..and from Euston you can get a train through the Chunnel to Paris and beyond. Yes I must admit that in terms of other cities I have been in London has the busiest but best system for moving people from A to B. And though it can take you an hour to get from London Bridge to Heathrow it is quicker than going from LAX to Hollywood. Walking down the streets of London there are two things you notice immediately – the English are rude when it comes to walking as they have one direction and that is straight ahead – no moving out of your way with this lot. Needless to say I love it when I have my backpack on. (You can guess what I do). And the other noticeable thing is that you can hear so many different languages. Evidently there are over 300 languages spoken in London today. There are also big open areas like Greenwich with its huge park and secluded bush like areas like Hampstead Heath. Not forgetting there is also the DRL which is the overground rail system. Yep, you can get to every corner of London one way or another. 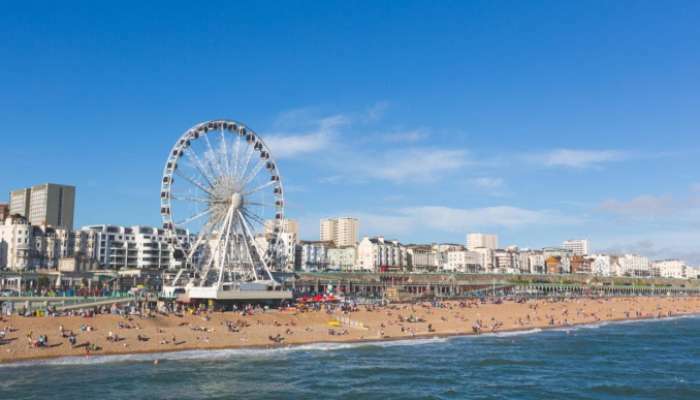 Brighton – This seaside city had great weather when I was there and with the town having a large market day and outside free park concert I had a very enjoyable visit. Brighton is south of London and takes 1 ½ hrs by train. It’s a very popular place with large hotels and B&Bs everywhere. There is a new pier. I have seen photos of the old one and in its day it was grand – (that’s an understatement by the way). The remains of the burnt out West pier still remain. There is a new walkway right along the waterfront which must be around 4-5kms long and along this promenade are shops, cafes, art and seafood stalls with some small rides for children. There’s amusement arcades for adults, bars, nightclubs and restaurants. Within the city itself are many shops. There are many museums, two universities, theatres, cinemas, churches and sporting facilities. Brighton also has trains that head off in all directions over England. It’s a great place to wind down but in summer is over flowing with visitors. If you are wanting to see The Eden Project then the place to head is St Austell in the county of Cornwall in the southwest of England. Many people haven’t even heard of The Eden project but believe me when I say it is a very interesting place to see and a 15 minute bus ride from St Austell. It used to be an old quarry until some people got together and started what today is a major attraction for this county. It is a massive site made of several greenhouse domes with plants from all over the globe. My friend and I spent 3hours or more here and must have taken 200 photos each. It’s a truly awesome site to see and to walk through. Next on our list was The Lost Gardens of Heligan. These gardens take up a 30acre area and are only a 20 minute bus ride from St Austell. This site took us a good 3 hours to see also. Included in the gardens was a Totara tree (these are native to NZ) which is believed to be the oldest Totara in the Northern Hemisphere, and another area of NZ which was donated to the Gardens after one of the Chelsea flower shows. This was so that they didn’t have to take it all the way back to NZ. This whole site is impressive and a great way to spend an afternoon. There are beautiful areas to sit and open areas where you can view the sea, do some bird watching or watch a squirrel eating nuts. 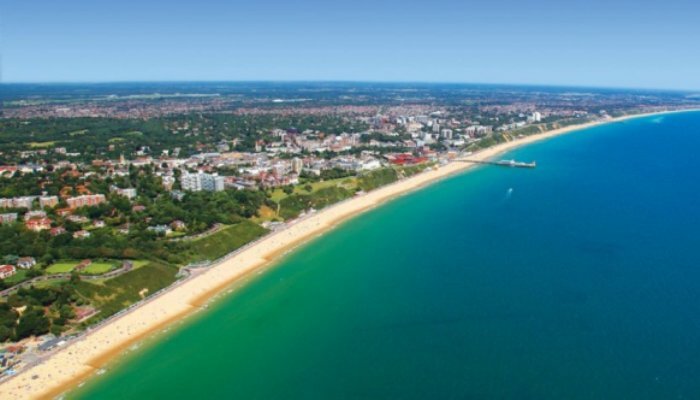 Bournemouth – This large coastal resort town is also to the south of London in the county of Dorset. From here I made day trips to Salisbury to see Stonehenge and Winchester. Christchurch, Poole and Southampton are also a quick train trip from this town. Bournemouth has a pier and a long beach which runs for about 11kms and Bournemouth sea front overlooks Poole Bay and the Isle of Wight… An artificial reef is to be constructed in Bournemouth which will be the first in Europe. By the time of writing this it should be completed. It also has gardens, a big square and the Bournemouth University. This town is like any other in England with grand churches, theatres and a museum. There are lots of sporting facilities and restaurants, clubs and bars. (One of these is the Walkabout). Shops included well known English names like Beales, Dingles, Debenhams, Marks and Spencer and BHS. Bournemouth has a large number of foreign students as it is a major centre for teaching English and has lots of English schools. From Bournemouth International Airport you can catch flights with Ryanair, EasyJet, Palmair and Thomsonfly to local and European destinations. In the centre of Bournemouth is a balloon attached to a steel cable which is called the Bournemouth Eye. Tourist can get hoisted up to 500ft in this helium-filled balloon and get a panoramic view including across the English Channel for over 20miles. This is a nice coastal town to see just like Brighton. I ended up going here twice. The second time was to house sit for friends while they had a holiday in Bulgaria. I do like Bournemouth but its cold. If you fly into Heathrow get an oyster card and put £20 on it. This can be used for the underground and the buses. It cannot be used for the DLR. When you leave the country you can sell it back to the oyster shop at the airport of take it home and pass it onto someone who is coming over to England. The English like to walk in a straight line so look out in the street as you are going to be knocking shoulders. Catch the train to wherever you want to go. There are so many going to everywhere all the time everyday………They are reasonably priced (for England) and quick. If you are on a budget you will find it hard as London is one of the most expensive cities in Europe. Don’t think you can rush around and see everything in 2weeks. It’s impossible. Get a map, decide what you want to see and try to achieve something every day. Plan to see things that are in the same area, then the next day do another area. Remember it takes time to get from A to B even with the underground. If you see an internet cafe take note of where it is as they can be hard to find. Best bet is Starbucks for wireless internet. Only good though if you have your own laptop. A lot of the time it pays to take a wind jacket that squashes down to nothing. The weather changes quickly and several times in a day. Don’t forget to get out of London. Stonehenge is still a mystery to me but something I always wanted to see. There hostels and hotels in Salisbury. Visit Winchester and go to the cathedral. It’s huge and interesting. That’s saying something to as I’m not really a church person but this one is truly worth seeing. There are also military museums in Winchester. I went to the Ghurkha Museum. If you post something home from the U.K. then get insurance on it. The 2 packages I have posted from here for N.Z. have never arrived and my Australian friend has had the same happen with his parcels – they never got to Australia.